MICDE has partnered with miRcore, a non-profit organization whose mission is to democratize medical research by building funds for microgrants to support innovative genetic research. MICDE is providing computational resources and support for miRcore outreach activities, as well as connecting our faculty to the miRcore team to provide expertise and to teach students about personalized medicine and end-user driven research. On June 6, MICDE affiliated faculty member Barry Grant joined miRcore’s high school club GIDAS (Genes In Diseases And Symptoms) in their 2016 Research Conference. The students had the opportunity to experience a real conference setting that helped build their interest in science. 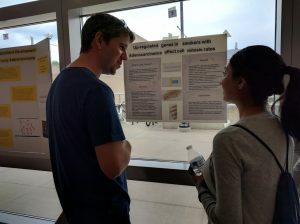 The students had a chance to give a talk about a research project, present a poster and hands-on workshops. The conference was a huge success. You can read the proceedings on miRcore’s site. From August 8-12, 2016, MICDE and ARC-TS will donate a Flux allocation and computational support to the GIDAS’ Biotechnology Camp for high school students. The donations will provide students the opportunity to become familiar with the Unix command line and get hands-on experience on computational genomics.